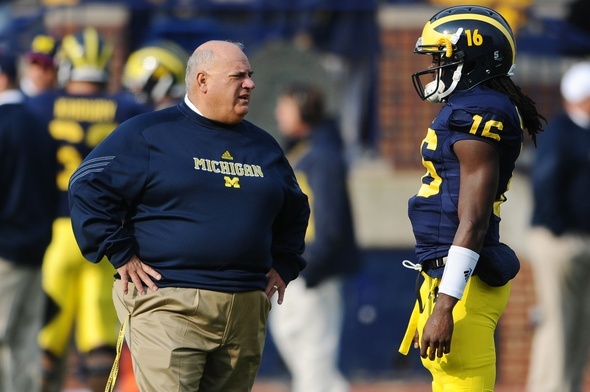 Posted on Tue, Nov 15, 2011 : 10:28 p.m.
Michigan offensive coordinator Al Borges, left, says ball security is a concern with quarterback Denard Robinson, right, but the rest of his issues are normal growing pains for a quarterback learning a new offensive system. Michigan offensive coordinator Al Borges knows people are unhappy with Denard Robinson's numbers. He knows Michigan football fans are perplexed by Roy Roundtree's declining production. He knows the Wolverines didn't score as many points as they could have last week against Illinois. He also knows they won. And winning, Borges said, sometimes requires "sticking your ego on the shelf" as a playcaller -- which, in turn, means the same for skill players who are affected by such decisions. "What happens is guys get too enamored with numbers and get away from what’s important, which is winning football games," Borges said of coordinators. "There’s going to be games when you have to throw more to win games. That happened against Notre Dame. There’s going to be games when you have to run more to win the game. That happened last week. Come back to AnnArbor.com at noon Thursday for a live chat with Kyle Meinke. He'll recap the Wolverines' win at Illinois, discuss news that emerged this week and preview the game against Nebraska on Saturday. "If you get too caught up keeping these beautifully balanced numbers, so this guy’s happy and that guy’s happy -- to hell with that. We don’t coach that way. We coach to win the football games and however it falls is however it falls." The Wolverines' defense was dominant in the team's 31-14 win against Illinois on Saturday, so Borges elected to keep the ball on the ground to keep the clock moving. Sophomore tailback Fitz Toussaint benefited with a career day, turning a career-high 27 carries into a career-high 192 yards. The flip side, though, is Robinson rushed only 12 times for 30 yards. He also attempted only 10 passes -- completing six -- which also means the receivers suffered statistically. Roundtree, for example, did not make a single catch against Illinois. He has only 14 through 10 games after leading the team with 72 (for 935 yards) last year. Borges, though, "doesn't give a damn," as long as Michigan scores more points than the other guys. "(Illinois) couldn’t move the ball on us, and there was only one way to lose that game," Borges said. "You know what it was? Screw it up. Fumble the ball. "We don’t want to pull our horns in, but you don’t need to keep your guns a-blazin’ either, because now you put your defense in a bad situation. "As the game goes, just like in war, the battle changes, OK? And as the battle changes, your ability to adjust and make good battlefield decisions, that may be sacrificial in nature, will dictate whether you win football games." Robinson has received more fire than any other player for his dwindling numbers, which are down across the board between last year and this year. He's also struggled more in recent games than he did earlier in the year. The junior has averaged 3.7 yards per carry in his past five games. He completed less than 50 percent of his passes twice in that stretch and threw seven interceptions, including at least one in each game. He has 13 on the season, fourth most in the country. Borges said ball security remains a concern with Robinson, but the rest of his issues are normal growing pains for a quarterback learning a new offensive system, particularly one that is so different from the one he was recruited to run. He pointed to the example of Cade McNown, the quarterback Borges inherited at UCLA. McNown was last among Pac-10 quarterbacks in passer efficiency in Borges' first season, and first in the country his second. Robinson's numbers also are down partly because of the emergence of Toussaint, who has led Michigan in carries each of the past three weeks. And that's OK, Borges said. "Denard’s growing in our offense and nobody wants to hear that," he said. "We told him from the beginning he’s not going to gain 1,700 yards. We’re going to try to get someone else involved, and I think we’ve done a good job of that. "There’s certain games he’s going to get more than in other games and, as long as we’re getting productivity from the running game, if it isn’t him, that’s fine." Borges said Robinson, even when he is struggling, still is effective because of the threat he poses. Borges pointed out the second play of the Illinois game as an example, when Robinson took three defenders with him on a play-action. Toussaint, meantime, got the handoff and went the other way for an easy 65-yard run. "People don’t always understand the residual effects of Denard," Borges said. "It’s not always him running for 200 yards, but him getting someone else to get the big yards and he’s helped in that respect." 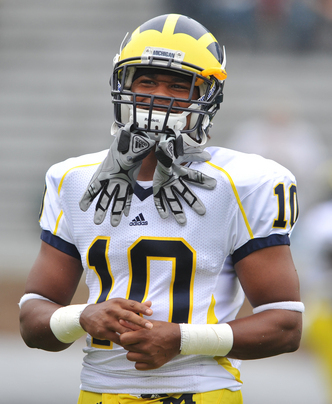 Michigan wide receiver Jeremy Gallon. Roundtree is not having a great statistical season. After making 72 catches for 935 yards and seven touchdowns a year ago, Roundtree has made just 16 grabs for 291 yards and two scores through 10 games this season. "He's just splitting time with Jeremy Gallon and Jeremy Gallon's been productive," Borges said. "We're not in four-wides all the time and, when you're splitting time, your numbers aren't going to be as good. That's really it. "Roy's been good. Roy's done everything we've asked him to do. But he wasn't going to catch 70-some passes (in this offense)." Michigan defensive coordinator Greg Mattison said it's important his defense gets back to fundamentals this week and plays with gap integrity as it prepares to face Nebraska. With mobile quarterback Taylor Martinez and downhill runner Rex Burkhead, the Cornhuskers have shown the ability to run the option with success this season. The duo has combined for 1,840 yards and 23 touchdowns this season. "When you're playing an option team, responsibility and doing your job is critical," Mattison said. "You saw it last week (against Illinois), we had a couple times where we didn't take the quarterback. And the two kids (that struggled with that) went through that probably 70 times in practice and did it perfect. "Then, all of a sudden there's that moment when the back looks real intriguing and they just want you to bite on that cheese, and they did. We've got to be disciplined playing a game like this." Michigan junior safety Jordan Kovacs says he's still wearing a brace on his injured left knee, but has not had any lingering problems since returning to action at Iowa two weeks ago. "It feels great," Kovacs said. "The trainers deserve a lot of credit for getting me back on the field quickly." Kovacs, Michigan's third-leading tackler with 53 stops this season, hasn't been forced to miss any game time due to injury since sitting out a win against Purdue last month. Mattison said he has not seen a dip in Kovacs' production. "If you were out there during games hearing him talking, he'd sound like a coach out there," Mattison said. "Some guys might've just now come back this week (from that injury), but he's played a couple weeks already. Thu, Nov 17, 2011 : 2:05 a.m. Anyone who followed Michigan Football last year, who does not recognize the improved coaching this year (including the offensive coordinator), has no understanding of football and should not embarrass himself with clueless comments. Tue, Nov 22, 2011 : 5:16 p.m.
Thu, Nov 17, 2011 : 1:52 a.m.
borges is the right guy for the job and we're lucky to have him here at this stage in his career when he's basically seen it all and has the necessary gravitas. go blue. Wed, Nov 16, 2011 : 11:35 p.m.
A preventative offense. Go into a shell offensively. What do they say about a preventative defense... It prevents you from winning. Al you are a genius ! The more this guy talks about his philosophy the more I come to realize what a big mistake Michigan made hiring him. Wed, Nov 16, 2011 : 11:27 p.m.
How convenient for Borges to say the record is what matters. They have been winning DESPITE Borges. This new staff is doing fairly well, not the greatest, but well. It's just our ( the fans ) love/hate relationship with the coaches that blinds us from the truth. GM is doing a heck of a job with the defense, that's obvious for everyone, no room for debate. But on the other hand ( offense ) this is where the coaching change and philosophy is effecting the team. It's not all AB's fault, he's called some good games and a couple bad games, or DR's, he's made some good plays and some bad, that's going to happen. The fact of the matter is everyone is learning, so M don't need to fire AB, or move DR to a different position, however, we the fans just need to be patient and understanding. We're handicapping the coaches/team with our selfish wants, all teams play to their strengths, if it's running, they run, if it's passing, they pass, it's their identity. What's M's identity? Pleasing the fans and alums. This offense has some weapons on it and can be explosive, they do not have to run the spread necessarily, but something conducive to their talent, this offense is taking away talent trying to implement their new scheme. Why? most of these player will be gone by the time Hoke's recruits come in and are ready to play. So why not give this group of kids the best opportunity to succeed? Because some would rather have them fall short and blame RR, than succeeding using his players. Michigan will not become a great team again until Michigan gets out of Michigan's way. Wed, Nov 16, 2011 : 8:13 p.m. Wed, Nov 16, 2011 : 6:50 p.m.
Rufus: &quot;I don't know the numbers, but I have to believe with the Michigan's defense 3 and outing the opponents so frequently-this years offense probably gets the ball at least 5 or 6 more times than last years offense.So they should be scoring much more than last years offense- if there was no improvement in the offense.&quot; The numbers show that in 2010 we averaged 73 offensive plays per game, so through 10 games last year we had approx. 730 plays. This year we have had 645 offensive plays so far in 10 games. So once again, you are off in your comments about our offense being &quot;1/2 as good as last year&quot;, or being &quot;obviously worse than last year&quot;, and now &quot;this years offense probably gets the ball at least 5 or 6 more times than last years offense. So they should be scoring more than last years offense&quot;. rufus, son, how can an offense that scores MORE (34.7 PPG vs 32.7), has a better percentage of converting 3rd downs, and has a better red zone percentage be worse ? Give it up man ! Wed, Nov 16, 2011 : 10:10 p.m.
We have few offensive plays because we are 3 and outing constantly. The fewer plays this years isn't a reflection of the defense it is in spite of the defense and getting the ball more. It is a sign that the offense is much worse. Wed, Nov 16, 2011 : 8:47 p.m.
Oh, goodness ... I wonder if last year's defense EVER forced a three and out? And I'm dead serious with that question. Because I can't recall one. This year's defense much better at forcing three and outs. I'm actually to a point where I believe they *will* force a punt on anything over 3rd and 4. Our offense has to generate better 1st down production. I think in games where we stalled we faced too many 2nd and 3rd and longs. That's when Denard simply does not do well. But then again, not many quarterbacks do. No problem DonAZ ... rufus' comments got me curious about the number of plays. The number of 3 and outs would be interesting to see ... I would think it would be safe to say that there are ALOT more 3 and outs caused by our D than last year. Wed, Nov 16, 2011 : 7:32 p.m.
Ooops ... didn't see you post before I responded with exactly the same point. Yours was first ... my bad for not noticing it. I do wish we had access to the number of three-and-outs. Wed, Nov 16, 2011 : 4:56 p.m. When comparing this years offense to last years everyone is forgetting one thing. This years offense gets the ball much more than last years offense. I don't know the numbers, but I have to believe with the Michigan's defense 3 and outing the opponents so frequently-this years offense probably gets the ball at least 5 or 6 more times than last years offense. So they should be scoring much more than last years offense- if there was no improvement in the offense. I'm not the only one who thinks so- Lou Holtz said the same thing. We huddle now and use more of the play clock each possession. This is why we have less plays even while possessing the ball more. It is also one of the contributing factors to the defense being better. Wed, Nov 16, 2011 : 7:18 p.m.
Let's see ... 2010 we had 941 offensive plays in 13 games for average of 72.4 offensive plays per game. In 2011 we've had 645 offensive plays in 10 games for an average of 64.5 offensive plays per game. So the numbers tells us we're actually running fewer offensive plays. I don't know of any way to get at the number of &quot;3 and outs&quot; our defenses forces or our offense suffers. Would be a hell of a good stat to have, though. Wed, Nov 16, 2011 : 5:46 p.m.
Holtz-Schmoltz, you believe THAT BAFOON? Repeat this 1000 times: transition, transition. Check with me next year at this time, if indeed this offense does not progress. Wed, Nov 16, 2011 : 5:20 p.m.
Our offense gets the ball much more and we don't have the pressure of scoring every time on the field because our defense is actually stopping teams this year. Last year's offense had to score every time on the field; that's a lot of pressure. Everyone is also forgetting we had a tougher schedule last year - UConn was tough, and we played 4 top 25 teams compared to two this year. We lost to Iowa putting up less points than last year against a defense that is probably half of what it was then. Wed, Nov 16, 2011 : 12:39 p.m. I'm liking Mattison more and more each game and Borges less and less. The defense is 100% responsible for why we have the wins. The offense is obviously worse than last year. Is it a &quot;Michigan man&quot; quality to take credit for something for which you aren't responsible? Wed, Nov 16, 2011 : 3:52 p.m.
Wolverine_in_MD, Rufus is coming around. Yesterday he was saying that the offense wasn't half of what it was last year, now he's to &quot;obviously&quot; worse. Given time he might actually learn to enjoy watching a winning team. Wed, Nov 16, 2011 : 3:46 p.m. There really is a form of willful blindness going on with respect to last year's offense. People seem to remember the first four or five games with Robinson making defenses look silly, but they forget the second half the season. I recall Mark May on ESPN last year calling for the Heisman process to give the trophy to Denard after the fourth game. Lou Holtz rolled his eyes and called that silly. Holtz proved to be right. And Mark May quieted down about Robinson for the remaining games of 2010. Most damning of all was a quote from a Mississippi State defensive player after the bowl -- &quot;This was easy. We knew *exactly* what they were going to do.&quot; That &quot;exactly&quot; was pretty easy to figure out. When the entire offense is Denard, it's not hard to figure out how to defend. And Mississippi State did it particularly well. Wed, Nov 16, 2011 : 2:39 p.m.
&quot;The offense is obviously worse than last year.&quot; PPG is down .3 points. 3/10ths of a point less than last year!!! Please tell me how that is &quot;obviously&quot; worse. Do you not watch the games? Do you not see the progress that Denard is making as a passer? Yes, he is making progress. AS A PASSER. When he makes bad decisions throwing the ball (the play where he hurt his wrist and the pass should have been picked off), he looks bad. But he made some nice throws, tight spirals, leading the receivers in the first half. Take away the injury play and he is 6 out of 9 passing, and the interception he threw was on a Hail Mary to end the first half. Those are actually some impressive stats. As Denard grows in the system and continues to work on being fundamentally sound when throwing the ball, I suspect he will wind up having a monster senior year. Oh yeah, he could quite possibly QB this team to 10 or 11 wins this year! This entire coiaching staff is incredible! Go Blue! Wed, Nov 16, 2011 : 2:25 p.m.
* sigh* ... yeah, you're right ... we should go back to the offense of last year ... you know, the one that sputtered hopelessly against Wisconsin, Ohio State and Mississippi State. Oh, and I've heard Denard would let us come sign the cast on his leg ... you know, for the injury he'd sustain running so much. Word is, there's a bunch of safeties in this league that would LOVE to hammer Robinson into the ground. Since they would know most of the offense would be Robinson, it'd be pretty easy to do that. I think I'd use a blue Sharpie for my signature. How about you? Wed, Nov 16, 2011 : 12:23 p.m. Besides the Al Borges comments, the number of former U of M football going on the local airwaves have said the same thing. The word here is transition. An 8 and 2 record to date is fine with me. The loss to Sparty still hurts but hey; they ARE the real deal, much as that hurts to admit. Sometimes, I get miffed at some of the play calls during a given game but let's not forget the big picture. Let's see how well the Michigan offense does against two of the better defenses in the conference. Kudos to Al Borges. GO BLUE!!! Wed, Nov 16, 2011 : 12:13 p.m.
For those who care to debate a mere .3 (that's POINT THREE POINTS PER GAME OFFENSIVE SCORING DIFFERENCE) see below 2011 (thus far) <a href="http://espn.go.com/college-football/statistics/team/_/stat/total/sort/totalPointsPerGame" rel='nofollow'>http://espn.go.com/college-football/statistics/team/_/stat/total/sort/totalPointsPerGame</a> 2010 <a href="http://espn.go.com/college-football/statistics/team/_/stat/total/sort/totalPointsPerGame/year/2010" rel='nofollow'>http://espn.go.com/college-football/statistics/team/_/stat/total/sort/totalPointsPerGame/year/2010</a> The year is not complete either, things can go up from here. The offense staying the same with the defense improving is the reason we have already ECLIPSED last years win total with THREE games to play. /that is all Go Blue! Wed, Nov 16, 2011 : 12:05 p.m.
What an outstanding coaching staff Michigan has. If for any reason you believe there is a better Offensive or Defensive coordinator available you're going to be hard pressed convincing anyone with a grain of football knowledge about them differently. I can go as far back as the Iowa game to prove my point in support of Mr. Borges, not one but TWO TOUCHDOWN passes dropped in the end zone (well one but it's a technicality) out of four plays. People were calling for roll outs against a 7 and 8 man blitz, ha! (ha! I say) Michigan fans are spoiled rotten and had better enjoy it while we have this coaching staff in order. I have seen the light through the trees my friends and it is shining brightly in Ann Arbor now a days. I'm telling you again it's unfair with this coaching staff, downright unfair and it will be proven more in the future. These guys are the best in the business. Go Blue! beat Nebraska. Wed, Nov 16, 2011 : 10:12 a.m. It is about winning, not statistics. Al is doing a great job. Our offense has to coexist with our defense, because our d has to rest. Also, Denard needs to make better decisions and not turn the ball over. We are 8-2 and have a chance to win the next two games, and if Denard can manage the game without turnovers we give ourselves a chance to win. Al is doing a fabulous job! Last week our running game was successful, and that means our offensive line did a great job too. The offensive line will be critical against Nebraska; make holes to run through and getting to the second level like they did last week, also pass protection. The defense had a great game against Illinois, but they have to be ready for Burkhead and the QB, because they like to explode to the inside just as much as the outside. This is the quickest QB we have faced yet, and beware of his passes because he throws rainbows that turn into pass interference calls. Denard must continue to improve these next two games, and realize what it takes to beat really good teams, not just pushovers scheduled early in the year. Roundtree stats down, so what! It is winning that counts. To get to the next level as a receiver he must learn how to block, and he is looking stronger this year. Wed, Nov 16, 2011 : 11:25 p.m. They have been winning DESPITE Borges. The Defense is the reason for the good record. Wed, Nov 16, 2011 : 6:57 a.m. I like Al, too. Just wish he'd be a better role model for ex-football players, fitness-wise. Wed, Nov 16, 2011 : 6:50 a.m. I haven't always agreed with some of the play-calling, but I do realize that we are very fortunate to have the staff that we do. I'm particularly appreciative to have Borges leading the Offense. I believe once the players have had more time in the system and also as we get more conducive personnel to run the system, we will be quite a formidable unit on the O. I would like an Offense that produces about 500 yds/game at least, split evenly between rushing and passing, making it tough on opposing Defenses. You know the Defense is going to be great in the future and as the special teams improve throughout the different parts like they have already this year this program is going to be a fixture in the top 10 if not top 5 year in and year out. Wed, Nov 16, 2011 : 4:48 a.m.
Really encourage people to watch Borges say all these things: <a href="http://www.youtube.com/watch?feature=player_embedded&v=PNJyPpKuAZ8" rel='nofollow'>http://www.youtube.com/watch?feature=player_embedded&amp;v=PNJyPpKuAZ8</a> The key is what he says about Denard's numbers vs. others -- if someone else is getting the yards, then Denard *not* getting the yards isn't an issue. If *nobody* is getting the yards, then that's a problem. Interesting comment attesting to the kind of attention Denard gets from opposing defenses. Borges cited a misdirection play where 3 Illinois defenders stayed with Robinson. That allowed Toussaint lots of room to run. Many people have said this, and I agree whole-heartedly ... if the Michigan offense can produce credible alternative threats, then Denard becomes WAY more dangerous then he was last year. After the game Toussaint had against Illinois you can be sure Nebraska isn't ignoring him in their preparations. That's two threats they have to cover, not one. Last year it was one -- Denard. End of sentence. It may not be popular sentiment on this board, but I like Borges ... a LOT. I think we're going to see some really good stuff out of him over the next several years. Wed, Nov 16, 2011 : 11:48 p.m.
Don , are you watching the games before you write these myths you create. The positive portion of Michigan's offensive production has come mostly from the read option. The fact they took away the passing option aspect of that read makes it so it no longer is a spread offense. Wed, Nov 16, 2011 : 3:07 p.m.
DonAZ always seems to articulate positions, I tend to agree with, so I'm going to 'hang in there', for the time being, with the M offense, and Borges. I have a lot of respect for AZ's perspective on all this. But I AM frustrated so far, and believe that 'misdirection', primarily running, and 'short, to mid range passing' can, and should be, increased in this offense. The running of course, is a function of the O-line. We are thin there, but the progress has been encouraging. (We'll miss Molk next year.) I am a big fan of both QB's, and believe that both these guys have great 'upside', in their game yet. We all know that the buckeye defense probably is the best in the league, but this Nebraska defense scares me as well! (No opportunity to 'look ahead'.) In reality, that ohio game is a season in of it's own anyway. We'll see if Borges is able to take advantage of what the 'black shirts' give us on saturday. It is the culmination of Hokes' program. And, of course , we need DRob to stay healthy, and stay in the game. Wed, Nov 16, 2011 : 5:32 a.m. Wed, Nov 16, 2011 : 5:31 a.m. I like him. We have won more games than in the past 3 years. He took Auburn to an undefeated season and they were 31-9 under his watch. That's more than anyone other than Professor Carr did, and he did it just once in 1997. So...I trust the guy. Also, Denard is still standing up and there are only 2 games left before the recess. That's a good thing. Wed, Nov 16, 2011 : 3:42 a.m.
Big Al what we want is for you to have the offense improve as much as the defense. That did not happen this year. Mattison did a terrific job. On offense I cannot say the same.At moo u and Iowa our offense was less than stellar. If the offense had improved any where near as much as the defense we would be packing for indy. Damn shame sending sparty. They are arrogant and have an offense as bad as any in the big ten. Wed, Nov 16, 2011 : 6:13 p.m. I'm more interested in whether this offense can score points against the tougher opponents. The RR gimmick offense could not, despite gaudy numbers. Last year, when RR was criticized, people pointed to the records Denard was setting. As if turning your quarterback into a running back, then comparing him to other running backs is a valid use of statistics. Then the offense laid an egg against every good defense it faced. Borges is not implementing a new offense because there was a problem with the 65 points RR hung on Bowling Green last September. He's doing so because of the 7 points RR scored against Ohio State in November and because of the -10 turnover ratio last year's team had in Big Ten play. &quot;Big Al what we want is for you to have the offense improve as much as the defense.&quot; This can't be repeated enough: 2010 Michigan 32.7 ppg finished the season 7-6 2011 Michigan is scoring 32.5 ppg and will finish no worse than 8-5 Granted, the offense is down about .2 ppg, however if 32 ppg isn't enough offense for a team to win games, how many points are required? Wed, Nov 16, 2011 : 5:45 a.m. The offense didnt leave nearly as much room for improvement as the defense did. I think Al has been ok this year, and has made steps towards installing his offense without completely forcing all of RR's spread players into something their not fit for. (see RR's first year) Al's offense so far is scoring almost exactly what RR's famous spread did. Wed, Nov 16, 2011 : 4:57 a.m.
Borges has exhibited FAR more flexibility than the previous coach ever did. Running Denard read option play after play after play after play simply will not work. For the life of me I can't understand why people think it would work. It didn't for a good portion of last year. Honestly, that's the stubborn fact staring us in the face. GOOD DEFENSES FIGURED OUT HOW TO STOP DENARD. And that's all it took. This year defenses have AT LEAST one guy committed to covering Denard and often two. It's no coincidence Toussaint has had a couple of nice games. Borges said so in the video -- on an early misdirection play three Illinois defenders stayed with Robinson as Toussaint galloped for a big gain. how can you expect 'improve' an offense with personnel built for the spread option, with a goal of implementing a pro style in the future? how? are you expecting an andrew luck type performance from Denard? thats like asking rich rodriguez to turn Steven Threet into pat white his first year coaching and assume no friction or growing pains whatsoever. and considering we're 8-2, we're doing just fine. about the defense: any time you change a 3-3-5 to a 4-3 in a run heavy conference you're going to see at least marginal improvement, but these players have bought in and are excelling, not just improving. so its not comparable to the offense. because the personnel is capable of running the system effectively. if you were Borges, and want to install a 100% pro style offense for Michigan, because that's what Michigan football is and it's what you've spent your career running and succeeding at, are you going to scrap plans for the future and unleash denard (only to fail against OSU)? only hurting the young offensive players and delaying confusion in the future??? no. you transition immediately, &quot;stats be damned&quot;, there is an agenda and we are going to follow it, and we are going to do everything we can to WIN while staying on that agenda. patience, the offense will come as personnel arrive. in the meantime, we have a decoy in denard, the legs of toussaint, and our defense to rely on.